Tip me up and pour me out! Teapot on the top, cup on the bottom, add a cookie and you’re all set. Ahhh, is there anything better than a Sunday afternoon, looking out a sunny window with a hot cup of your favorite tea. If you have friends who love their tea, be sure to check out these little gems at BestHomeFashion.com. This pretty one makes loose leaf tea preparation so easy! With the purrfect cup to match. BestHomeFashion.com has great gift ideas! BUY MORE, SAVE MORE – $10 OFF $100, $15 OFF $150, $20 OFF $200 & $50 OFF $500 AND MORE. Not sure if it is the 70 degree temperatures in late November, or the effects of our online shopping ability, but yesterday when I took my soon-to-be 11 year old granddaughter birthday shopping at the mall, it was NOT crowded. And, the traffic was fairly light even for a normal Saturday. I think the perfect scene is a balance. I did enjoy shopping at a locally owned pet store on Small Business Saturday; they were super appreciative. It will be interesting to see how this holiday shopping thing evolves over years to come. I hope we will continue to see a bit of everything. Today, I am staying home. If that is your plan as well, stop by one or more of my favorite online places and check out some great gift ideas for inside or outside your windows. And if your windows are dirty, I always suggest that you HIRE A PROFESSIONAL. Buy the gift of window cleaning, and improve someone’s outlook on life! I almost titled this post wrong. Our family celebrated Thanksgiving this past Sunday because it meant the whole family could be there. With other commitments it just is not possible to do on the actual day. I thought about using “faux” or “pseudo” in the titled, and then I realized that “real” was much more appropriate. I was so grateful to have EVERYONE there, with no one missing and even a few extra. That meant all five kids and their mates, and all six grand-kids. No one posed for these pictures, but you get the idea. Not everyone make it into the pictures, including me, but the vast group is obvious. Thank goodness for a huge living/dining area at daughter’s home. And we even got the littlest member, Oliver, who was born way early at about one and a half pounds and still has a feeding apparatus at age three, to enjoy some pumpkin pie with his uncle Stace. We are all super happy when he eats! All went well, ending off with a beautiful sunset seen from the foothills of Albuquerque. So, while I am being so self-indulgent, I will add the part about the new dog who lives at my house. He looks like a little deer, and he really is a little dear. Meet Prancer. He enjoyed the day as well, and now he knows the whole family. A real Thanksgiving is when you can enjoy it with family, friends and pets, no matter what day it is. I hope all of you are as fortunate as I am. Gratitude is easy, and it is free. To our country’s very best. I originally posted this back in 2012. After this weekend’s tragedy in Texas, I thought it was still valid. This morning, I was thinking about a conversation I had with a man who belongs to a study group I attend. He was commenting about how sometimes he is amazed when he is driving at how few mishaps there really are. Overall, drivers do what they are suppose to do. I have often thought that myself. It applies to vandalism as well. With all the potential situations that could occur, for the most part, people respect each other. In fact, when you think about how much doesn’t happen that could, it far outweighs what does happen. I am sure this would not indicate to all those people affected by the terrible event this week in Colorado. What happened to them far outweighs what should ever happen to any of us. It is so appropriate to have them in our thoughts and send them well wishes. That being stated, it is also a very good time to remember that most of us get up each day with an opportunity to be very grateful that most people respect each other and want the same thing for others that they want for themselves. The unfortunate, and even evil, things that happen are not the rule, they are pretty minuscule in the whole picture. I am so glad I have a category titled “windows to the soul” so I can get away with a post that has absolutely nothing to do with business, at least not directly. When I was a kid, I absolutely loved Halloween. The years I remember the most are those between the age of 9 and 13. I lived in Portland then and it usually rained. I did just check the weather report for today and it looks like it will be dry, as it will be here in Albuquerque. Halloween Stores were not so common then, and for at least 3 years I dressed up as a clown. Not sure I even like clowns that well, but back then it was good choice because I could make up the costume: shirt and pants from Dad, make-up from Mom and a pillow. My Halloween candy bag was a pillow case. And, usually I carried an umbrella! Oh, how I wish I had taken more pictures of my kids on Halloween. My memories are hard to picture here, but there were some great times. And, when you have four trick-0r-treaters returning with all that candy it is quite an event. Fast forward to the next generation, the grand-kids. When they were newbies they would often come here to have the fun in the same neighborhood their parents used as kids. I would at least get to see them come here to get their treat at our door. A few days prior we would make the appropriate Halloween cupcakes. Such fun, and now the generations of Halloweens move forward. Thank goodness I get lots of pictures still, so I can know what they dress up as before they hit their own neighborhoods. I know that those days will end too soon. I might even have to snap a few pics when those little ones from this neighborhood come to the door tonight. Let’s go to the movies! And, don’t forget the popcorn. Can you think of movies with the word “window” in the title? My research shows that many are somewhat scary or creepy. Just right for this time of year. Probably the best is Alfred Hitchcock’s REAR WINDOW from 1954. It had very strange stuff happening with Raymond Burr outside Jimmy Stewart’s windows. What a classic! Personally, I was disappointed with SECRET WINDOW (2004) even though it did have Johnny Depp in it. THE WINDOW has been used 3 times so far. Only the first one (1949) looks worth watching. I have never watched CONFESSIONS OF A WINDOW CLEANER (1974). I know several professional window cleaners who have though, and what they learned had nothing to do with cleaning glass. Having experience with owning a window cleaning company makes me curious about those stories for sure! If you have a favorite movie, please tell. 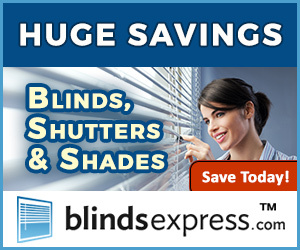 Sometimes blinds, curtains or shutters just don’t fit the bill. You want something unique for your windows. If you have never visited WallpaperForWindows be sure to check out all the fun things you can do for privacy or decor. When you visit their site you get a lot of guidance on measuring and applying. They will even do the cutting for you. Whether you want pretty or privacy, WallpaperForWindows offers a solution. Here is a great idea for smaller pane windows that need some privacy or color? 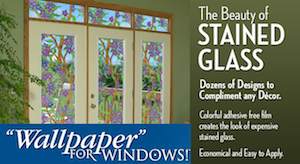 Colorful window tint from WallpaperForWindows, is easy to apply without any adhesive. If you are hesitant about accurate sizing they offer a “trim to size” service too. Check out all the selections, and have fun! Adhesive-free window film – no mess, no fuss. Static-cling decorative film can be used on any smooth, non-porous surface. DIY product, installs in minutes, looks great for years! Easy to clean, removable, and reusable. Improves privacy and security while allowing natural light to enter. The plumpest sort they sell. and only left the shell. a jagged mouth and two enormous eyes. for all to see Our jack-o-lantern grin. It is the last weekend of the 2017 Albuquerque International Balloon Fiesta. This event has happened every year since the early 1970’s and it is the largest of its kind on the planet. It is not unusual to see hundreds of balloons in the sky all at once, and the launch field often has close to 100,000 people watching the early morning ascent. One year we hosted a balloon pilot and hit the field every morning. No sleep that week! If you have never been to the fiesta, make it a point to put it in your plans. Albuquerque is beautiful in the fall. Check out the official site for the BALLOON FIESTA to learn more. Start planning now because it gets crazy toward the actual event.